A couple of weeks ago I bought this bun sponge twist tool on ebay for $0.99 INCLUDING postage?! Well I was prepared for it to be crap or a Nigerian internet scam but I am pleased to report it is neither. It is foam covered aluminium wire. 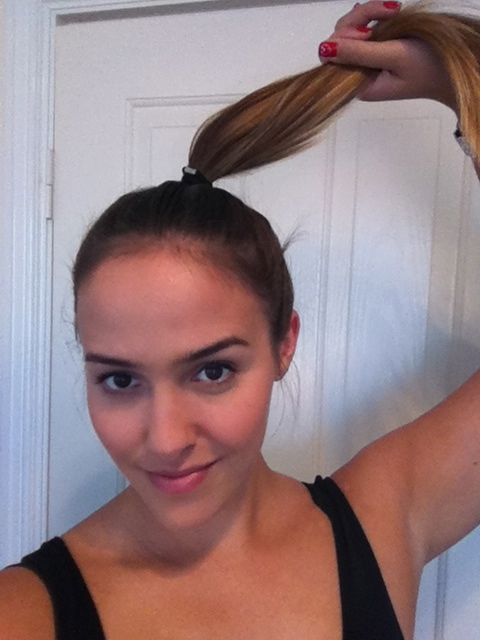 Start with your hair in a pony-tail. Thread your hair through the slit in the middle of the twist tool and roll downwards towards your head. Then bend the ends of the sponge together, adjust your hair to cover the foam and voila! Bun perfection. What was the last thing you bought for $0.99?! This entry was posted in Fashion and tagged Ballerina Bun, Bun Sponge, Hair, Hair Style, Hair Tool, Top Knot. Bookmark the permalink. I use to have these when I was in middle school! I had like 4 different ones in different sizes. They were sold on an infomercial and my dad ordered them for me haha. I don’t remember what happened to them, but I didn’t use them much because my hair has never been long enough. It even came with a book showing you how to do different hair styles using these things. Haha awesome. I can’t imagine what other kind of hairstyle you could make with this though… Apart from lots of different sized buns rather than just one?! This is AMAZING, I need one as well!!! lol what an amazing device!! I’ve always wondered how people got their buns so perfectly…alas!